For the international work we produced some multi-language materials. You can download the pdf documents here or order the printed paper versions at the International Network Office. To help with translation, see Materials/Status. All materials have been printed - you can order them or download and print them yourself. All materials shall be translated to other languages, too, and will be provided for download on this webpage when finished. The location of “Under the surface – Om bergen faller sönder“ produced in 2010/11 is the Hotagen, a mountain area in the North of Sweden. The documentary has been produced by film director Klara Sager from Sweden. Young, well-educated geo-engineers and technicians are hiking through a beautiful landscape in search for uranium, without any feeling, about what will happen to that amazing place of earth if one day uranium mining starts. On the other side, you have normal local people, elderly, who do not want uranium mining nor uranium prospecting happen in their land. It is interesting to see, that Swedish people who are against uranium mining are not young students or “hippy”-type activists, but normal, elderly people. Under the surface also brings to light another kind of modern generation conflict – technicians and engineers fresh from the university working for international mining companies against elderly local people, grocery shopkeepers, housewives and the indigenous Sami, reindeer herders, with a totally different concept of nature and living. Flyer to motivate people to become active on an international level and to subscribe to mailing lists or newsletters. Feedback sheet to join the network - to send contact information to the network and to join projects, meetings or subscribe mailing lists / newsletters. 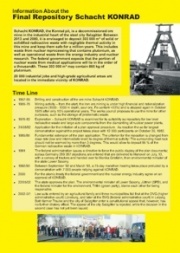 These are presentations/lectures offered by activists and experts of the Nuclear Heritage Network. 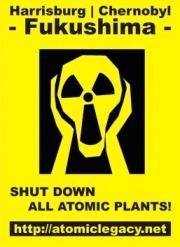 You are free to use the files for your anti-nuclear work and events. And you are welcome to invite the speakers given in the contact information to give these presentations in your place. 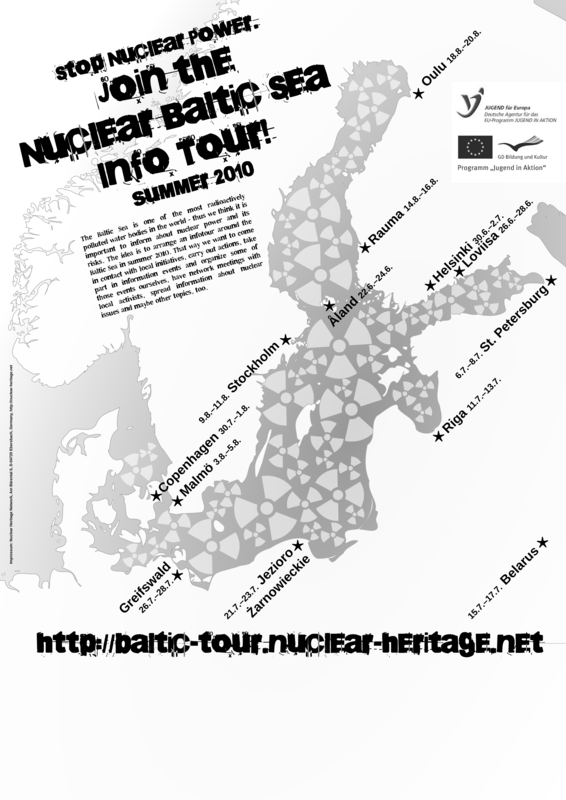 It is a presentation of the Nuclear Heritage Network, its basic ideas and targets as well as it is showing some international activities people of the Network took part in. The presentation takes some 30 minutes. It can also be offered in German. Another presentation on the Nuclear Heritage Network. Short overview on history, aims and activities of the network. The Baltic Sea is one of the most radioactively polluted seas in the world due to a minimal water exchange with the Atlantic Ocean. Chernobyl accident, nuclear weapon tests and reprocessing plants were the biggest polluters in the past, while these days a number of so-called "civil" atomic facilities are releasing big amounts of radionuclides contaminating the sea. Several governments in the watershed of the Baltic Sea are intending to increase the radioactive pollution of the region when they are pushing new uranium mines, waste repositories and nuclear reactors. Until today more than 60 atomic facilities have been in operation or are supposed to be started. Water makes the communities in the watershed of the Baltic Sea close neighbours - even though some of them are more than 1,000 kilometers away. Seven countries are affected: Denmark, Sweden, Finland, Estonia, Latvia, Lithuania and Poland. In addition, Russia, Germany and Belarus partly share the Baltic Sea watershed. The Baltic Sea is not only important as food source for millions of people, but also an important recreation area for many more - and it is a transport medium for poisonous emissions from more these than 60 atomic facilities discharging pollutants to water and air. Thus, the Baltic Sea is connecting needs and interests of human populations of a wide area forming an unique community. The lecture is supposed to raise awareness on the threats posed by nuclear power around the Baltic Sea. It will introduce the topic and offer more detailed information on specific plants. Additionally an impression of anti-nuclear movements in the Baltic Sea region can be provided. This slide show is about nuclear facilities in Germany, major German policy on the nuclear field and about the final disposal projects in this countries. 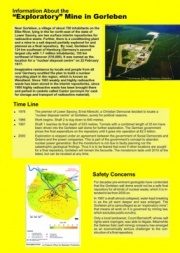 It also includes some information on planned anti-nuclear activities. As some details change frequently it is necessary to check before using the presentation for updates on the data. The presentation takes some 60 minutes, depending on the deepth of the lecture. It can also be offered in German. 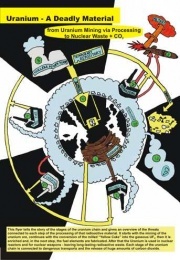 Based on pictures of anti-nuclear actions in Germany you will get an overview about the diversity of actions in the German anti-nuclear movement, its successes and strategies in the struggle against nuclear power. Presentation about the Fukushima disaster including information about the accident, status of the Fukushima reactors, additional accidents and incidents, political reactions and health impacts of the catastrophe. The slides are currently provided in German only, but the presentation can be held in English, too. 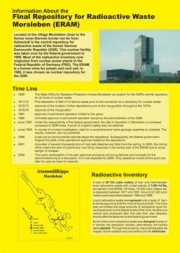 Information about the Chernobyl site, basic facts of the accidents, rescue measurements, radiation doses, consequences of the catastrophe, lies of authorities and politicians, Chernobyl as a political symbol and conclusions. 62 slides with images of the accident and from Belarus (victims of the accident, liquidators, "empty villages", actions). The presentation explains different aspects of the uranium chain from Uranium Mining via Processing to Nuclear Waste and CO². 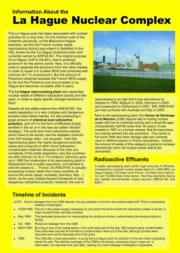 It provides an overview of the threats connected to each step of the processing of that radioactive material. It starts with the mining of the uranium ore, continues with the conversion of the milled "Yellow Cake" into the gaseous UF6, then it is enriched and, in the next step, the fuel elements are fabricated. After that the uranium is used in nuclear reactors and for nuclear weapons - leaving long-lasting radioactive waste. Each stage of the uranium chain is connected to dangerous transports and the release of huge amounts of carbon dioxide. The example of the African country Niger, one of the poorest countries in the world, which still after liberation from colonialism suffers the affects of exploitation by European powers, points out how the consumption habits in western countries destroy the natural resources elsewhere. One of the most important reasons for flight and migration is a lack of livelihood. While certain circles in Germany complain about so-called economic refugees and claim those would just intend to get a nice life here at our costs, we have to self-critically recognize how our consumption and economy are responsible for actually creating the necessity to leave one's home. The Republic of the Niger is economically totally dependent on exploiting the radioactive uranium. Particularly the French company Orano (formerly: Areva) is responsible for the contamination and destruction of ecosystems, abysmal labor conditions and bad safety at work, minimal salaries and sicknesses of the inhabitants due to the reckless uranium mining. On the other hand Orano makes big profits with the processing of the resources to fabricate fuel elements for nuclear reactors, including for German ones. The consumption of nuclear power generated electricity (still 11% in Germany) as well as the trade with shares and bonds of the companies benefiting creates a joint responsibility for the situation in the strapped country. Instead of stoking up resentments against the victims of our economy solidarity with them and pressure on the responsible ones are required. The lecture starts with a topical overview on the situation in Niger, particularly on the impacts of the uranium mining. Afterwards a discussion of the highlighted problems will take place. 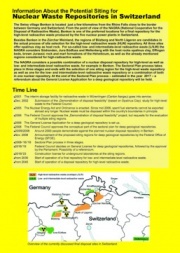 Presentation on the current nuclear waste situation in Germany (as of November 2011), on the history of the Castor protests and overview on the scheduled actions, events, camps and info points at the 2011 Castor transport from La Hague (F) to Gorleben (D). Four short movies combined to the lecture motivate for the participation in the Castor protests: ER KOMMT, Immer wenn der Castor rollt, Du schreibst Geschichte, Gorleben lebt. The slides and films (except for "Immer wenn der Castor rollt") are currently provided in German only, but the presentation can be held in English, too. This lecture gives an overview about the disposal of nuclear waste in Germany, the four more or less "official" final repositories for radioactive materials and about basic challenges of the final disposal of longterm radioactive waste. It takes some 60 minutes including a little bit of time to ask questions and to have some discussions. The presentation can be offered also in German (smaller file). Huge amounts of dangerous long-term radioactive nuclear waste are produced by nuclear power plants - it's not only a threat for people and environment today, but also for future generations over about 1,000,000 years. No safe final disposal site has been found anywhere in the world during the last more than 50 years - and this lecture explains why the aim of a safe final disposal of nuclear waste is anyway impossible. On the example of the nuclear waste situation in Germany - where four so-called final disposal sites were in operation or are proposed to be used for that issue - the challenges of final disposal will be showed. The lecture will also discuss the Scandinavian concept for final disposal of nuclear waste and show that this model is even worse. The event will be held in English by the German campaigner and journalist Falk Beyer. He did studies and research on the history of the former GDR final disposal site Morsleben and published several publications on this topic. The Scandinavian disposal concepts will be a topic for discussion afterwards, and at the end we´ll get to see a video concerning the topic. In 1969 the site selection for the proposed central nuclear waste repository of the GDR was made for Morsleben at the in those days border between FRG and GDR near Helmstedt. Up to the end of the GDR about 15,000 m³ of low level and medium level radioactive waste were stored there. After the reunion the federal government did not give up the dangerous "stalactite cave" (cite Greenpeace), but stored even more: some additional 22,000 m³. Morsleben is faced to water influx and collapse danger, besides the intolerable geologic conditions. Based on photos and historical documents this lecture provides an extensive introduction to the history of the so-called "final" repository Morsleben. All relevant aspects examined by the "Morsleben project" will be discussed in this event. The experience with this presentation showed us that this is a "heavy" information event due to the mass of facts and documents. It is not recommended for an audience looking for a "light" slide show to be lulled by. The slide show can be downloaded here, though the scanned documents and photos need some coments by a speaker to get the meaning of them. The slide show includes copies of documents of the German Federal Archives that can only be copied, distributed and used with permission of the Federal Archives. Thus, you must not use them besides for the information events the slides are supposed to be provided for. The slides are currently only provided in German, but the presentation can be held in English, too. This is slide show on the resistance against the repository in Morsleben is shorter and less information overloaded compared to the "Einblicke in die Tiefen eines Endlagers". Also here an introduction to the history of the so-called "final" repository is provided based in photos and historical documents. The main focus are the phases of the resistance. The presentation provides an impression of the diversity and explains the backgrounds of the criticism on the nuclear waste dump. The slide show can be downloaded here, though the scanned documents and photos need some coments by a speaker to get the meaning of them. The additional list of key points capability to compensate this aspect is very limited. In an informal talk we exchange knowledge about the ERAM and figure out what information you are particularly interested in. In this group the contributor will tell about the site selection procedure, the reposition of waste, the operation of Stasi informants at the plant, safety problems, the resistance against the ERAM and whatever you would like to know. This event often already took place, and there has been good experience with this format. Based on this roundtable, new appointments for the consolidation of knowledge, activities etc. can originate easily. The former central final disposal site of the GDR is situated some 100 km east of Hannover and some 180 km east of Berlin in the German state Saxony-Anhalt. It is a former salt mine with a number of safety problems such as the danger of collapse, water flooding the mine and other problems resulting from an unsuitable geological situation. Since 2003 the operator of the repository - the federal office for radiation protection (BfS) - is introducing some 800,000 cubic meters of "salt concrete" (a mixture of salt, concrete and further materials) into the caverns to "stabilize" the mine. In August 2009, the operator had to admit that a cavern with nuclear waste will cave-in soon: Some 20,000 tons of the repository will cave-in. That would effect the surface like a small earthquake, they said. This would not be the first cave-in in Morsleben. The salt concrete is particularly responsible for this threat: The weight of the concrete is adding forces to the salt structures of the mine and will probably cause a collapse of the concerned cavern. The presentation covers the history and current safety issues of the German final repository Morsleben. Morsleben is currently in the process of being shut down. On October 22nd, the public consultation process regarding the closure concept began. However, it will never be possible to make Morsleben completely safe, as it is already affected by water leakages into the mine, as well as cave-ins of large parts of the caverns. Lecture and information event on the so-called "final" repository for nuclear waste in Morsleben/Sachsen-Anhalt (D) including films. The information event starts with a historical documentary ("Morsleben - und was wir dagegen haben") produced by Greenkids e.V. in 1995 made in bad quality but giving an impression of the early resistance of the youth environmental organization against the ERAM repository. The actual lecture takes some 30-45 minutes, and will be closed by a documentary on the cave-in risk produced by the operator of the repository, the BfS emphasizing the safety issues discussed before. 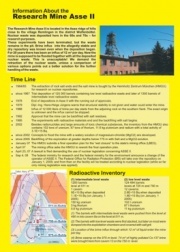 The information event provides basic knowledge in the history of the ERAM repository, legal procedures, resistance, lawsuits and threats, and it informs about the operators plans to close the plant leaving the dangerous waste in the mine faced with risks of flooding, collapse and release of the radioactive inventory. This documentary was the very first video production of Greenkids e.V. and was made in 1996. The lack of experience with the medium video is obvious. Nevertheless, this documentary provides a good impression of the spirits against the Morsleben repository in the 1990s. The documentary can be lent without a contributer, of course. Copying and distribution of the video is fine. However, we recommend a combination of the screening with another element in respect of content, e.g. the roundtable on the Morsleben repository. This is an overview of good brochures and other materials from other organizations. We provide both the download links as well as the homepages of the organizations where you can order these specific materials. Beyond - short film: 10,000 years in the future, a warning rings out from the far-distant nuclear past. Stop-motion animation based on genuine US government research into how to warn future generations of the presence of radioactive waste. This page was last modified on 29 November 2018, at 18:40. This page has been accessed 138,259 times.